Note: all boards pictured in the shop can range from 5'10"-6'5" without any additional charge. Design Concept: This board will perform well in all types of waves. 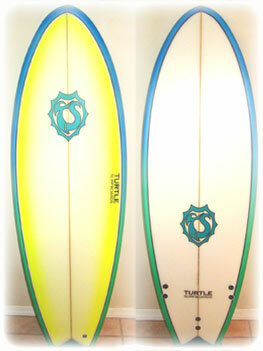 A great board to have for the traveling surfer. It’s also not a bad choice for the local surfer who just wants to pick up a board and go. This board keeps it simple. With the mini-squash design it trims nicely in the pocket, is responsive through turns, and adds more drive than your usual squash tail. With this shape we also made it a little wider for the flats and or smaller surf and to help you paddle into the “good stuff.” With just a pinch more rocker in this design it can very easily handle and help you control the speed of the reef breaks abroad. 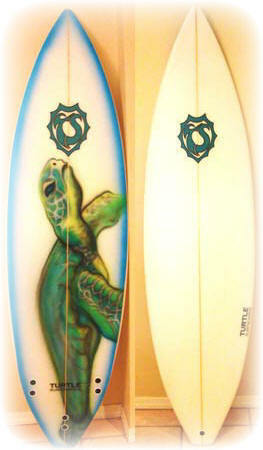 Equipped with FCS and your choice of bottom paint (If you don‘t like the turtleJ ). We give this model the customer choice award. Model Concept: This board is designed for the beginner, the over-sized surfer, or even the long boarder who wants to take a step in the direction of performance based surfboards without losing his soul approach. Most of this design takes elements from the standard performance board and the “fish” design and infuses them with a long-boarders mentality. It is shaped for stable, smooth surfing. It is full of float and glassed to last with a high gloss finish. Equipped with thruster (3) or quad (4) FCS fin systems. Truthfully, anyone can have a blast on this board in the summer surf. * Attention Parents: The Porgy can also make for a good learning board for your son or daughter to enjoy. This board is a great investment with years of fun for everyone! Design Concept: Ride this board 4-6 inches less than your standard board. The overall shape gives this board its name. Much like the Porgy this board has a wide body, rounded blunt nose, and it’s fast. The bottom contour blends from a flat bottom in the nose/mid-section into a double V concave toward the tail and through the fin area. It has much less rocker than your standard “fish” models which increases its speed and keeps it designed for performance surfing in small waves (1-5ft). Also, the double concave V-bottom allows you to accelerate on demand. TRUST ME…You’ll blaze through the line-ups in the small surf. This model has gotten rave reviews in the Florida summer surf so no matter where you live, if you surf the small stuff this board should definitely be in your quiver. Design Concept: If your looking for a board that is fast and loose look no further. This model is designed for high-performance surfing. It has a responsive rail-to-rail transition and a swallow tail that allows for controlled and easy release. It comes equipped with a thruster or quad FCS fin system. This board is intended for the more advanced surfer. It is available in a high gloss, semi-gloss, and/or the sanded finish. 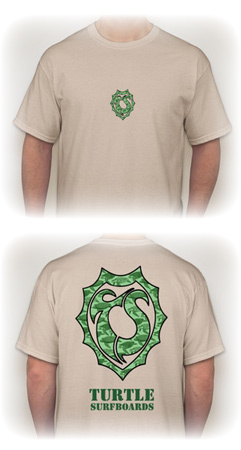 You may also personalize the logo placement. Gildan Ultra Cotton T’s are made of a heavyweight, high quality, 100% preshrunk cotton with double stitched seamless collars to ensure comfort. for the style you are looking for. Hats will be coming soon too.